2010 was the 200th anniversary of Mexican Independence and the 100th anniversary of the Mexican Revolution. To celebrate this fact I made a graphic score for the silent film QUE VIVA MEXICO by the Russian director Sergei Eisenstein to be played by a large group of improvising musicians. The basis of my score is a composition that I wrote and recorded in the early nineties for a compilation cd on the French label NATO records dedicated to comic books published by Spirou Magazines and Les Edition Dupuis. I have two pieces on the cd titled Jerry Contro K.K.K. and Les Vengeurs Du Sonora. My score for Que Viva Mexico is based on Les Vengeurs Du Sonora. There are two versions of my score – one for a solo performance and another for several musicians. There is a short trailer and two sound clips. Hollywood’s loss was Mexico’s gain, as this glorious documentary will attest. 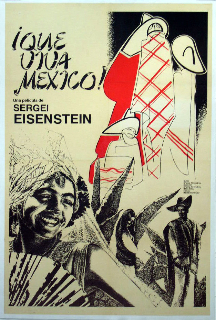 Having failed to realize several projects in Hollywood, Russian film pioneer Sergei Eisenstein trekked to Mexico with producer Grigory Alexandrov and cameraman Eduard Tisse, and the famous writer Upton Sinclair as beneficiary. Their budget quickly ran out, and the film was never properly completed, but Alexandrov carefully assembled this version of Que Viva Mexico! in 1979, and the result is one of the most beautiful documentaries ever made. Celebratory, socially alert, and at times even surreal, the film displays all of Eisenstein’s revolutionary techniques while proving that his narrative style could have flourished in Hollywood. Instead, this marvelous film stands as a testament to what might have been. Many film-historians are convinced that ¡Que viva México! is one of Eisenstein’s greatest films. ¡Que viva México! stood at the crossroads of Eisenstein’s artistic development and at a crucial point in the evolution of the art of the cinema. Conceived as a gigantic tableau of Mexican life, the film is a startling portrayal of the dramatic interaction between the ancient Mayan civilisation and the Spanish conquistadores and the modernising mythology of the Mexican Revolution.